EVA Air's home hub at Taipei's Taoyuan Airport offers not one, not two, but four lounges: each designed to serve a different set of passengers. A revent visit to Taipei afforded the opportunity to visit EVA Air's The Star lounge, which caters for Star Alliance Gold frequent flyers taking Star Alliance flights in premium economy or economy class (business class passengers are directed to another lounge, as are the airline's own highest-tier frequent flyers). Here's a look at what The Star lounge has to offer. Situated in the airport's international departures area (beyond passport control), you'll find The Star by taking the escalator upstairs in Terminal 2 just behind those passport counters, and which shares a reception desk with The Infinity lounge next door. ... joined by floors and other furniture in a similar colour palate. The Star opens daily from 4:30am until 11:30pm, with no boarding calls except for delayed flights to minimise disruptions. EVA Air Infinity MileageLands Gold members prior to EVA Air and Star Alliance flights. Other Star Alliance Gold frequent flyers departing on an EVA Air or other Star Alliance flight. These travellers also have access to the Singapore Airlines SilverKris Lounge at the same airport under Star Alliance rules, while EVA Air and other Star Alliance business class passengers may also visit EVA Air's The Infinity lounge next door, which has an upgraded look and feel and more extensive dining options than The Star. 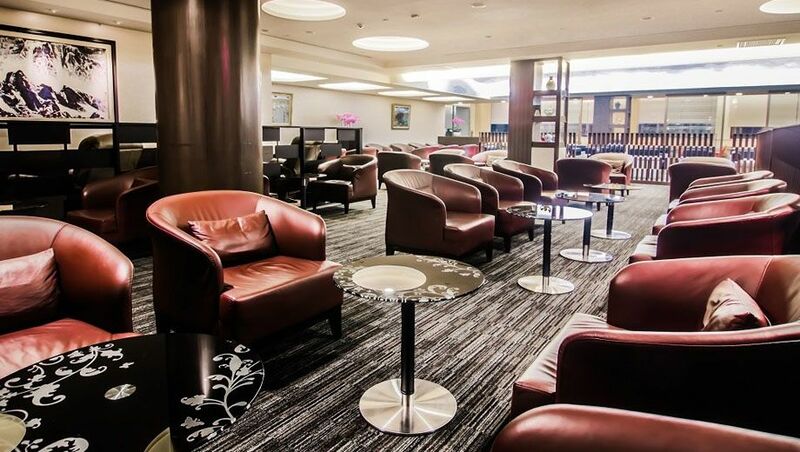 Additionally, EVA Air's top-tier Infinity MileageLands Diamond cardholders can visit the exclusive The Garden lounge nearby, while MileageLands Silver cardholders flying economy or premium economy may visit EVA Air's The Club lounge close by. ..... and a DIY rice noodle bar, with clear instructions. WiFi speeds for connecting your own devices sat around 32Mbps for both uploads and downloads, being more than sufficient for most travellers – even those streaming or downloading HD video. While the working spaces of this lounge were almost vacant, most of the 'relaxation' zones were occupied until closer to boarding, when I was able to snap a few quick photos. ... and shower facilities are available: just speak to the staff to secure your place. All things considered, with a reasonable range of food on offer paired with places to work and relax, The Star is the go-to lounge of Star Alliance Gold frequent flyers travelling in premium economy or economy class, and in that respect, the offering is fair. But if you're perched up in business class, you'll be better-accommodated at The Infinity lounge next door, which features a much more modern design, extra space to relax, and broader food and dining options more on-par with the expectations of business class flyers. Better yet, if you're an elite Infinity MileageLands Diamond cardholder, you can also visit The Garden with its noodle station, cocktail bar and generally quieter atmosphere, as The Star tends to be quite busy, particularly before the banks of flight departures to Europe and North America. Chris Chamberlin travelled to Taipei as a guest of Star Alliance and EVA Air. Quite nice - certainly better than China Airlines' full business class lounge at TPE. Reminds me of SQ Krisflyer gold lounge in SIN! Comment on "EVA Air's The Star (Star Alliance Gold) lounge, Taipei"